Last year around this time my Mom told me about this great food blog called "Our Best Bites". 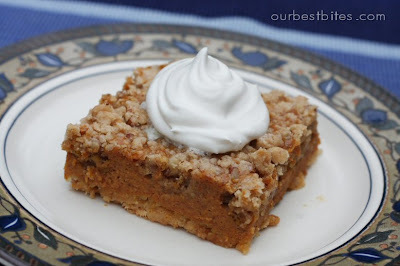 It's a really great site and that's where she found this recipe for Easy Pumpkin Crumble. I made it for a Church gathering and it went over so well that I made it for Thanksgiving! In fact, I think we got away with just having this instead of pumpkin pie, I might be wrong though. Anyway, I've never been a fan of pumpkin pie, but I love, love, love this stuff! In fact, I have been wanting to make it for a while now, but am waiting till Thanksgiving because I fear I will just eat the whole thing by myself otherwise! It's THAT good! Hey, I'm glad you like this, thanks for sharing it on your blog!